As the Turtles search through Chinatown for a gift for Splinter, they’re suddenly caught in a downpour. They duck inside a curio shop and the owner greets them warmly. Michelangelo is immediately drawn to a red dragon-shaped bottle, but the curio shop owner says that it isn’t for sale. Instead, he offers to show them a flat-bottomed wok good for cooking pizzas and the Turtles try to convince him to give them a “free demo”. Suddenly, a gang of hoodlums kick the door in. They’re upset at the curio shop owner for missing his “protection” payment and say they’re going to destroy his shop to teach him a lesson. The Turtles intervene, but the fight begins to get out of hand, wrecking the shop anyway. With no alternative, the curio shop owner spikes the red bottle on the ground, shattering it. From the smoke, a large creature calling itself the Warrior Dragon emerges. It challenges the punks to a battle and the youths immediately flee in terror. The Warrior Dragon then vanishes as quickly as it came. As the curio shop owner collects the pieces, he tells the Turtles that the Dragon has “expressed itself” and needn’t linger any longer. He likens his speedy departure to the rain clouds which, now that they’re emptied themselves, have parted to let the sunshine through. The Turtles are glad things worked out, but still insist on the free demo of that pizza wok. *This story is continued from TMNT Magazine (Welsh) #1. The story continues in TMNT Magazine (Welsh) #3. *The Warrior Dragon’s origin as depicted in the Archie series, in TMNT Adventures #20, was considerably different. In this incarnation, the character of Chu Hsi is omitted entirely. *And as a reminder, the character of Warrior Dragon is the same as the Playmates toyline character Hothead, albeit with yellow scales rather than red. *The curio shop owner is not named in the comic, but in the Archie series he was identified as Fu Sheng. This is one of the alternate origins that firmly sets the Welsh TMNT Magazine continuity apart from the Archie TMNT Adventures continuity. A bit of a shame, as TMNT Magazine might have been a good place for some “bonus” TMNT Adventures shorts, but eh, what’s done is done. If all the dates are accurate, this comic actually represents the first appearance of Warrior Dragon/Hothead. 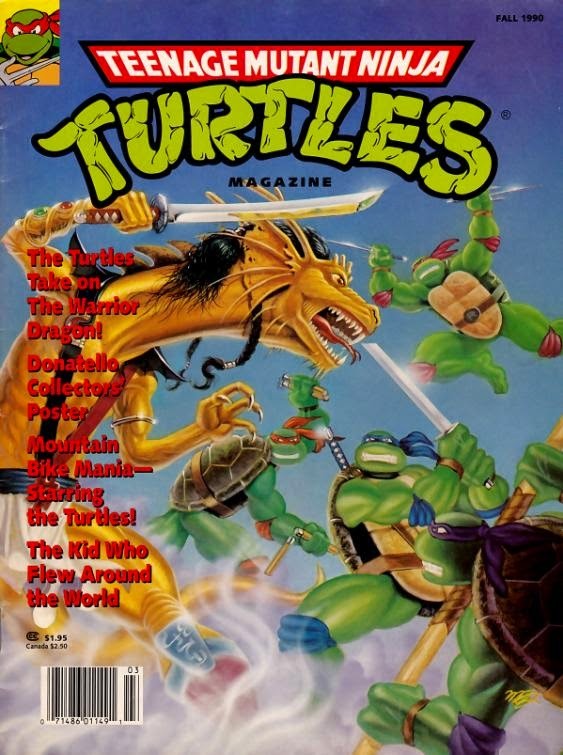 This issue of TMNT Magazine came out in Fall of 1990, Archie’s TMNT Adventures #20 came out in May of 1991, and Playmates’ Hothead action figure was released in the 1992 assortment. So when you read this story, it’s basically a blueprint for the TMNT Adventures issue (and later, the bio on the back of Hothead’s action figure). Dean Clarrain (Steven Murphy) would later pump it up by adding Chu Hsi to the mix, giving Warrior Dragon a stronger identity. As he appears in this story, oh so briefly, he’s basically just a genie in a bottle that says “boo” and vanishes. 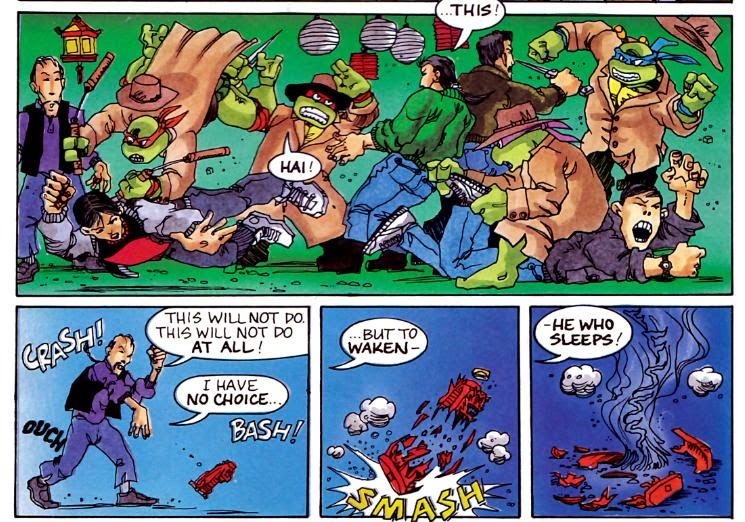 His participation in the story is so minimal, it almost feels like this is Clarrain’s way of teasing the meatier tale that would appear in TMNT Adventures the following year. Why hasn't Warrior Dragon returned yet? Come on Nick! So this isn't part of the Archie continuity? Does it fit in with the Fred Wolf continuity?